Now that we’ve bid farewell to another November, many of us have begun thinking of and preparing for Christmas. During a ride around town last night, we found many neighbors and businesses have already decorated for the holiday. This weekend, I’ll put our candles in the windows, and take down my autumn garden flags and replace them with Christmas ones. I prefer a “live” green wreath for the door, so that will have to wait another week or so, as will putting up and decorating the tree. 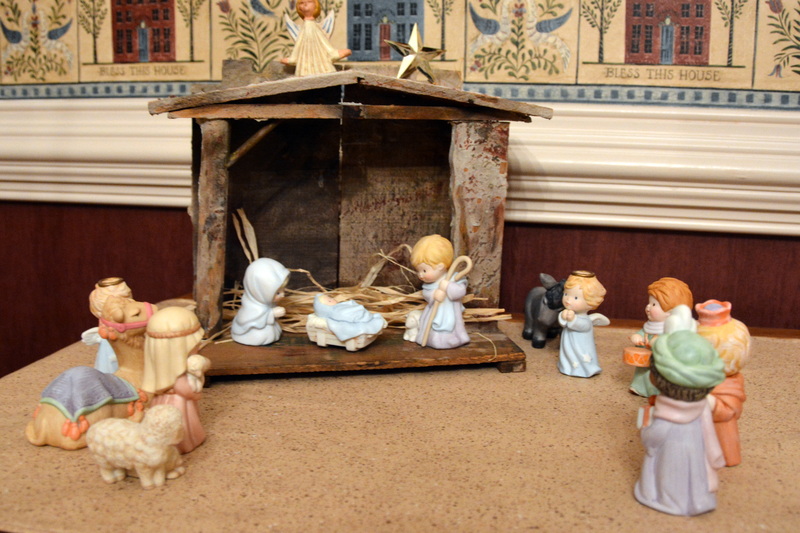 One long-time tradition I have is displaying this Precious Moments nativity. I began collecting these figurines when Marshall was a little boy, and have added to them through the years. Some were received as gifts and some were found on E-bay. I was tickled to find the creche at an antique shop a few years ago. I seem to be further ahead than usual in the gift purchasing department, and that makes me happy. And there are ideas floating around in my head for not-yet-bought gift possibilities. I discovered this video a couple of years ago and saved it to my favorites on my computer. Watching and listening to it always gets me in the holiday spirit. How are you coming along with Christmas preparations? What always helps you get in the Christmas spirit? This Christmas morning, I say thank you to all of you who take a few minutes of your day to stop in and visit. Thank you for your kind comments (and to my fellow bloggers, thank you for clicking the “like” button). All of us at These Days wish you and yours a very Merry Christmas and much happiness and good health in the New Year.